Cyclone Steel offers you an extensive selection of fully traceable steel plate in industry‐standard oilfield, pressure vessel and structural grades. Depending on the material grade, our stock includes thicknesses up to 14”, widths to 120” and lengths to 480” – with larger sizes available on demand. If you require only cut shapes, we utilize oxy‐fuel cutting, multi‐torch burning, high‐definition plasma cutting as well as CNC beveling technology. Should your components need further work, we regularly provide secondary plate processing including but not limited to rolling, ASME & AWS Welding, machining and testing. Traceability is essential to our business – and yours. Cyclone Steel’s inventory control system assigns a unique number to every plate entering and every cut part leaving the facility, while maintaining the original Heat Number and associated material data throughout the process. Excellence is a core value at Cyclone Steel. 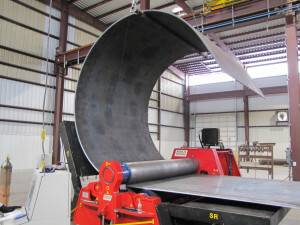 Fabricators, equipment manufacturers and machining companies from multiple industries have depended on the integrity of materials, extensive manufacturing services – and support of the Cyclone Steel team for over three decades.